posts. Applicant must possess Bachelor of Science in Agriculture or its equivalent from any recognized University. Age limit for AAO Jobs is 21 years to 32 years as on 01-01-2017. Eligible/ willing ST candidates can apply for OPSC AAO Jobs using the official website of Odisha PSC @ http://opsconline.gov.in. Online application forms are accepted from 17-11-2017 to 18-12-2017. After successful submission, candidates need to send hard copy of applications with copies of required Documents/ certificates before 26-12-2017. Candidate selection for Odisha PSC AAO Recruitment is based on career marks and viva voce test. Scale of Pay for AAO jobs is Rs. 9300/- to Rs.34,800/- plus carrying GP of Rs. 4600/-. 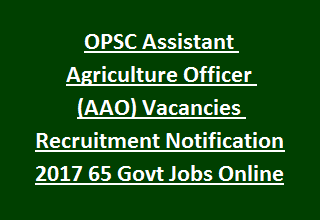 Full details regarding Odisha Public Service Commission OPSC Assistant Agriculture Officer AAO Exam Recruitment Notification Important dates, Application Procedure, Mode of Selection, Educational Qualifications, Pay scale details are mentioned below. Total available AAO vacancies in OPSC Recruitment are 65 posts. Applicant must possess Bachelor of Science in Agriculture or its equivalent from any recognized University. Age of the candidate must be below 32 years and above21 years as on 01-01-2017. Relaxations applicable as per Govt rules. Scale of Pay for AAO jobs is Rs. 9300/- to Rs. 34,800/- plus carrying Grade Pay of Rs. 4600/- and other allowances. Candidate selection for Odisha AAO Jobs in OPSC Recruitment is based on career making and viva voce test. Candidates will be shortlisted for viva voce test based on their career weightage, which are given below. Scheduled Tribe Candidates of Odisha are exempted from the payment of application fee. Candidates must go through the OPSC detailed advertisement and apply for OPSC AAO Jobs using the official website http://opsconline.gov.in. Fill the application with instructions and submit from 17-11-2017 to 18-12-2017 till 11.59 PM. Last date for sending hard copy of applications with required documents is 26-12-2017 by 05.00 PM. Documents and certificates to be attached with application are mentioned in the OPSC Notification. Hello I am searching for latest jobs . Please help me by providing details regarding GSIDC Recruitment and OPSC AAO Recruitment . Will be thankful enough.